Hillary Clinton longtime lieutenant Huma Abedin’s exhaustively documented connections to Islamic terror are receiving renewed attention thanks to a new column written by political gadfly Roger Stone. “She may be all of these things,” writes Stone, who is close to GOP presumptive presidential nominee Donald Trump. 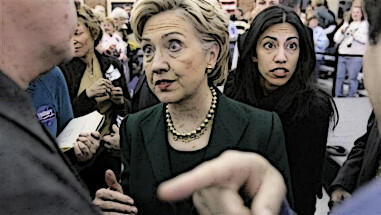 Abedin’s background, including her suspect ties to Saudi Arabia, was previously examined by FrontPage but sounding the alarm about her connections to the Islamist underworld takes on a heightened urgency now that polls suggest Clinton is dangerously close to assuming the presidency. Abedin has been joined at the hip to Hillary for decades and would probably be a major figure such as policy director or chief of staff in the White House if she wins. The power this daughter of jihad could -- once again -- wield over Americans and world affairs is truly frightening. For all we know, Abedin may have played a role in shutting down counter-terrorism measures that could have been useful in preventing Islamist attacks in the U.S. and abroad. Stone’s report was part rebuttal to a lie-packed column earlier this year from Media Matters for America, the “conservative misinformation” monitoring group Clinton brags about founding. Placed in the unusual position of having to attack its liberal allies in the mainstream media, the MMfA post purported to debunk a relatively mild Vanity Fair profile that examined Abedin’s Islamist ties. Stone’s report comes in the wake of the jihadist bloodbath perpetrated early Sunday morning by Omar Mir Siddique Mateen at Pulse, a popular gay nightclub in Orlando, Fla. Police said Mateen wielded a semiautomatic Sig Sauer MCX rifle and a Glock 17 handgun to kill 49 innocent victims and wound another 53 in what has been called the worst mass shooting in American history and the worst domestic terrorist attack since 9/11. It was widely and incorrectly reported by the Second Amendment-hating media that an AR-15 rifle was used, probably because it fits the Left's predetermined narrative. The Left fetishizes the wildly popular AR-15, portraying it as a monstrous weapon of mass destruction because in 2012 it was used in the mass shootings at Sandy Hook Elementary School in Newtown, Conn., and the movie theater in Aurora, Colo. It was also used in the mass shootings last year at Umpqua Community College in Roseburg, Ore., and in San Bernardino, Calif.
Islamic State claimed responsibility for the weekend attack after it took place. Mateen himself “claimed allegiance to the Islamic State and praised the Boston Marathon bombers,” before being killed by police on the scene, the New York Times reports. The Orlando attack is the 86th Islamist terror plot in the United States since Sept. 11, 2001, according to the Daily Signal. It is the 20th Islamist attack or plot "aimed at large public gatherings, such as bars and restaurants, shopping malls, parks, and conventions" and the sixth Islamist domestic terror plot or attack in 2016 alone. FrontPage readers already know the basics about Abedin and her family’s generational ties to the Muslim Brotherhood. Born in 1976 in Kalamazoo, Mich., Abedin's mother is Pakistani-born Saleha Mahmood Abedin, widow of Indian-born Zyed Abedin, an academic who taught at Wahhabist Saudi Arabia's King Abdulaziz University. Mr. Abedin was affiliated with the Muslim Students Association (MSA) at Western Michigan University. The MSA was founded in the 1960s by the Muslim World League (MWL), Saudi Arabia’s largest charity, which is also a militant organization with links to Osama bin Laden. In 1978 the Abedins moved to Jeddah, Saudi Arabia. Islamist Abdullah Omar Naseef hired Mr. Abedin to work at the Institute of Muslim Minority Affairs (IMMA), an Islamic think tank. Huma’s parents became members of the editorial board of IMMA's publication, the Journal of Muslim Minority Affairs, which Andrew C. McCarthy has said seeks "to grow an unassimilated, aggressive population of Islamic supremacists who will gradually but dramatically alter the character of the West." Naseef himself is an extremist with ties to al-Qaeda. In 1983 he became secretary-general of the MWL, an organization McCarthy calls “the Muslim Brotherhood’s principal vehicle for the international propagation of Islamic supremacist ideology." Huma’s mother became an official representative of MWL in the 1990s. When her husband died in 1994, Mrs. Abedin became the IMMA's director. She currently serves as editor-in-chief of its journal, identified on its website as “Saleha S. Mahmood.” She is also a founding member of the related group called the Muslim Sisterhood. When Huma returned to the U.S. and interned in the Clinton White House she was simultaneously a member of the executive board of George Washington University's MSA. From 1996 to 2008, Abedin was assistant editor at the Journal of Muslim Minority Affairs. Her brother, Hassan Abedin, and sister, Heba Abedin Khalid, are both editors at the publication. The MWL has received more than $1.3 billion from the Saudi government since 1962, Stone notes. Naseef, the MWL, and Pakistan created the Rabita Trust in 1988 which a month after 9/11 was designated as a terrorist front and its assets frozen. The Treasury Department said the trust is run by Wa’el Hamza Jalaidan, who founded al-Qaeda with Osama bin Laden. Jalaidan’s assets are also frozen. A radical cleric named Abdullah Azzam and his protégé, bin Laden, created an organization called Maktab al-Khidamat or MAK in Pakistan in the 1980s to recruit terrorists and raise money. Azzam subsisted on money from the MWL, Stone writes. MAK founders operated in Peshawar out of the office of the MWL and the Muslim Brotherhood. MWL funded MAK using Saudi money “that would eventually go to jihad against the West,” Stone adds. While bin Laden and Azzam rubbed elbows at the MWL's office the league’s president was Naseef, benefactor of the Abedin family. On 9/11, Huma was working for Clinton, then a U.S. senator from New York. As the Twin Towers fell Abedin failed to step forward “to shed light” on Naseef, the MWL, or the Rabita Trust. “Sen. Clinton and Huma Abedin betrayed every New Yorker and every American with their silence,” Stone writes. He notes that on Sept. 18, 2006, while earning a $28,000 annual salary, Abedin purchased a $649,000 Washington, D.C. apartment. "[W]here did the money come from?" Recall that Clinton served as secretary of state from Jan. 21, 2009 to Feb. 1, 2013, during which she poured gasoline on the Muslim world and lit a match. She failed to support the “green revolution” uprising in Iran in 2009. She engineered the “Arab Spring,” a period of civil unrest, wars, and revolutions in the Arab world that began in late 2010 and was followed by the Arab Winter, a backlash that made Islamism and authoritarianism ascendant in the region. She helped the Muslim Brotherhood overthrow longtime U.S. ally Hosni Mubarak in 2012 to clear the way for their candidate, Mohamed Morsi, to assume the Egyptian presidency. Hillary helped to oust Libyan dictator Muammar Qaddafi, a move that plunged Libya into chaos. In that anarchic environment Muslim terrorists attacked a U.S. facility in Benghazi, Libya, on the 11th anniversary of 9/11. Clinton failed to provide proper security and did not send U.S. armed forces to attempt a rescue, leaving four Americans dead. She also lied about the nature of the military-style attack, claiming it arose out of Muslims’ anger at an obscure anti-Islam video. While Hillary was getting people including U.S. allies like Qaddafi killed, ruining lives, undermining American power, advancing political Islam, and lying to the faces of the Benghazi victims' families, what exactly was Abedin doing behind the scenes? Americans need to know what, if any, role Abedin played in Clinton’s decisions that put Americans in harm’s way, started wars, and caused governments to fall. The stakes are too high not to know. Hillary's contribution to the American experience is the Hummatoma.